In August 1865, after 1200 miles of the Atlantic cable had been laid, disaster struck when the cable broke and sank 2½ miles into the ocean. 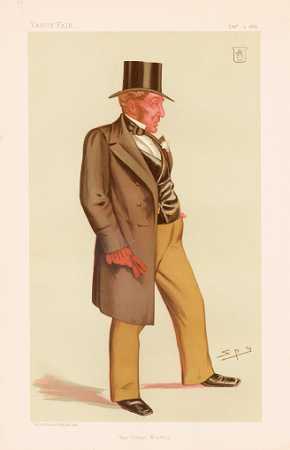 Sir Daniel Gooch, Brunel’s friend and colleague, who had bought the Great Eastern at a bankruptcy sale and had taken $250,000 in cable stock in exchange for use of the ship, was on board when the accident happened. In the letter shown below, written at “Lat 51-40-30. Long 14-4”, Gooch describes in graphic detail the vain attempts to retrieve the cable. This is a very significant letter, as all the histories of the cable quote Gooch’s description of the loss of the cable, and the event is described in detail in Gooch’s diaries and memoirs. by Spy (Leslie Ward), December 9, 1882. W.H. Russell’s book, with lithographs from original drawings made by Robert Dudley on the 1865 Great Eastern cable laying expedition, including attempts to recover the lost cable. W.H. 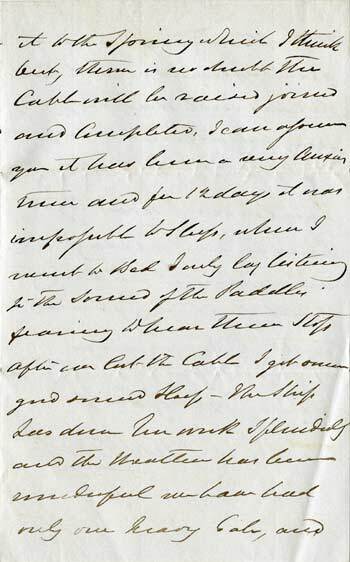 Russell’s manuscript diary of the 1865 expedition. An 1866 article from Scientific American (below). 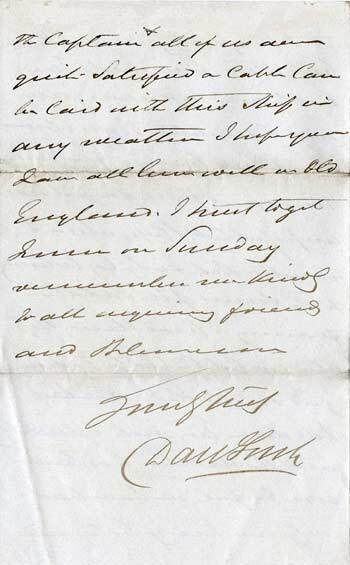 A letter from Sir Robert Peel to John C. Deane, later Secretary of the Anglo-American Telegraph Company, concerning the loss of the cable. An 1884 article by James Graves on the failure of the 1865 Atlantic cable. The story of the Recovery of the Cable in 1866. 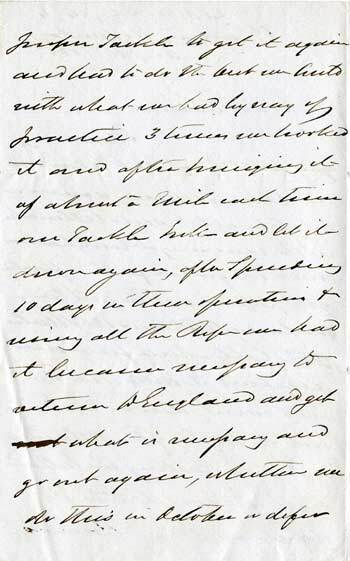 Click on each image for a full-size view of the letter page. of the papers and the public. fearing to hear them Stop. Gooch was notorious for his illegible handwriting. In 1972 Roger Burdett Wilson transcribed and published eight recently rediscovered volumes of Gooch’s manuscript diary, and noted that the 1892 partial transcription of these documents had many errors because of “Gooch’s admittedly difficult hand.” This is an understatement. 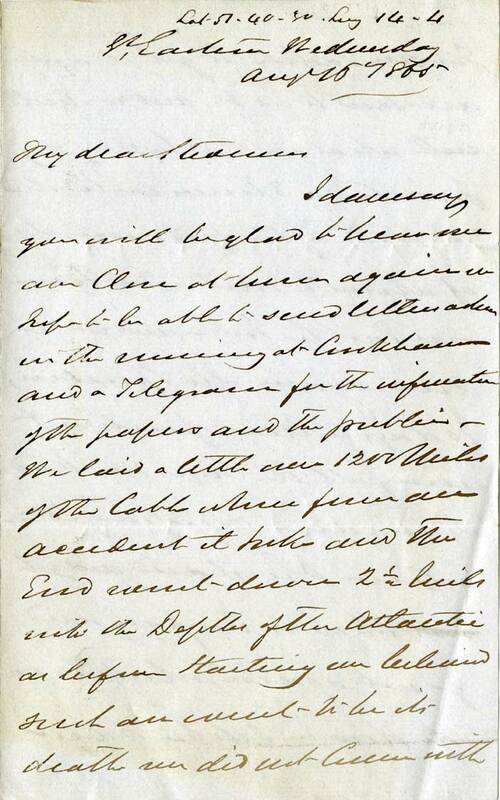 The transcription here of Gooch’s 1865 letter is the best interpretation of a group of document specialists, but suggestions and corrections are welcomed. Words in doubt are indicated by (?). I daresay, you will be glad to hear we are close at hand (?) again. We hope to be able to send letters ashore in the morning at Crookhaven and a telegram for the information of the papers and the public. We laid a little over 1200 miles of the cable when from an accident it broke and the end went down 2½ miles into the depths of the Atlantic. As before starting we believed such an event to be its death, we did not come with proper tackle to get it again and had to do the best we could with what we had. By way of practice 3 times we hooked it and after bringing it up about a mile each time our tackle broke and let it down again. 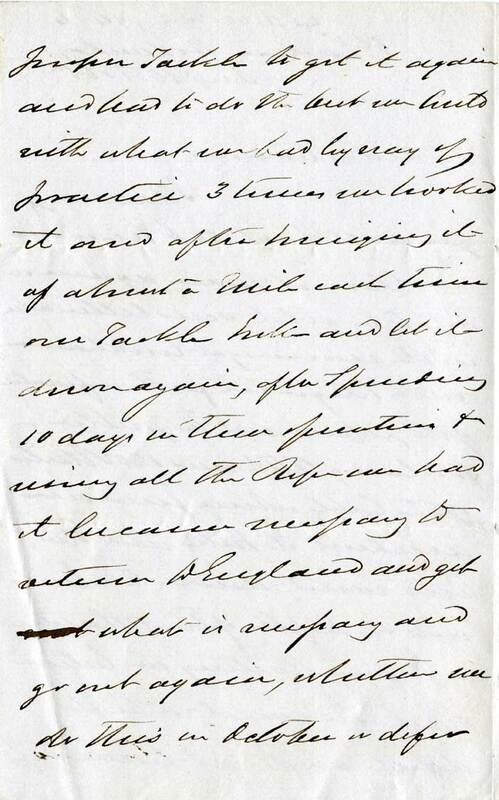 After spending 10 days in these operations & using all the rope we had it became necessary to return to England and get what is necessary and go out again. Whether we do this in October or defer it to the spring, which I think best, there is no doubt the cable will be raised, joined and completed. I can assure you it has been a very anxious time and for 12 days it was impossible to sleep. When I went to bed I only lay listening to the sound of the paddles fearing to hear them stop. After we lost the cable I got some good sound sleep - the ship has done her work splendidly and the weather has been wonderful. We have had only one heavy gale, and the Captain & all of us are quite satisfied a cable can be laid with this ship in any weather. I hope you have all been well in Old England. 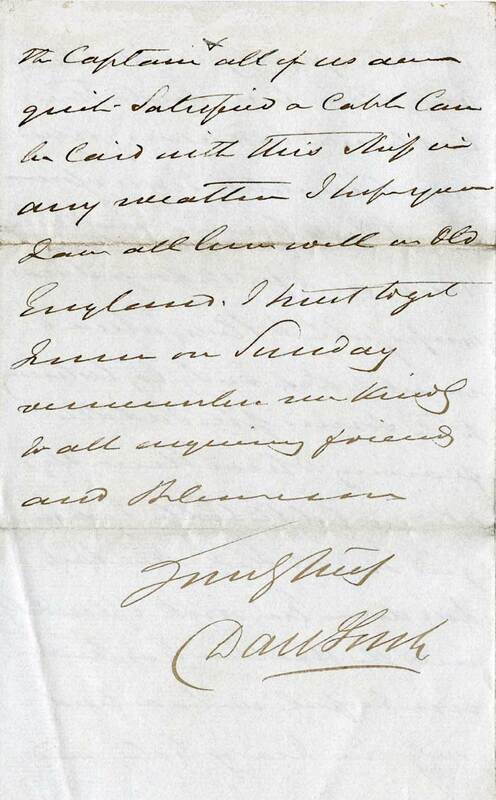 I trust to get home on Sunday [August 19th 1865]. end of the Atlantic Telegraph Cable August 2nd to 11th, 1865. The failure of the great Atlantic cable is at length confirmed. A dispatch from Heart’s Content, by way of Aspy Bay, states that on the 14th inst. the schooner First Fruit, which arrived at Harbor Grace, N.F., reports having on the 6th passed a buoy marked “Great Eastern, No. 3.” A few hours later she communicated with the Terrible, the consort of the Great Eastern, and learned that the cable parted on the 2d inst., and that the buoy marked the place where it had disappeared. As the parting took place where the water is about 14,000 feet deep, there is little probability that the cable can ever be recovered. The Anglo-American Telegraph Company has been established for the purpose of executing, in the course of the present year, the enterprise of laying a submarine cable between Ireland and Newfoundland; so as to connect telegraphically the Old World and the New, and to raise the cable partially laid last year in order to complete a second line to America. Further extracts from the article, below, give additional information on the loss of the 1865 cable, and the plans to retrieve it. published by Scientific American, Inc., New York. PROSPECT OF RAISING THE OLD CABLE. Mr. Gill said they had a great deal of this property at the present moment at the bottom of the Atlantic, and he would like to hear from Mr. Canning whether, if it was in a proper conducting electrical state, it could be used hereafter for a cable. Mr. Canning would refer Mr. Gill to Mr. Varley. He could only say that from the tests they had read, the cable was in the same condition it was in when it was made. Mr. Varley said since the cable was submerged it had been continually tested from Valentia, and it showed no change whatever. It insulated about four times as well as when it left the Medway in the Great Eastern. Mr. Canning replied that he believed they would certainly get the cable again. When they unfortunately lost the end on the 22d August last, they all naturally thought it had gone from them for ever. They were not, however, to be beaten by such a thought as that; and although they bad not appliances at the time sufficient for grappling and bringing to the bight of the cable from a depth of 2,000 fathoms, they had sufficient buoy rope to buoy it up, and it obliged to leave the buoys from stress of weather they could find these again. After a consultation upon grappling for it, they had no difficulty in finding the cable, and in hooking. In their very first attempt they met with the greatest success; and although they had at first great doubts about ever knowing when they hooked the cable, from the weight of the Great Eastern, the great depth of water, and their cable only bearing the weight of seven tans, they thought they should not have the knowledge indicated on board when the cable was hooked. To their great surprise, when they came to the cable, the Great Eastern began to swing round to it, and there was no doubt they had hooked some thing at the bottom. (Hear, hear). They commenced lifting seven hundred fathoms from the bottom, when the swivel parted with it. Now, it was an indicated fact that they lifted the cable seven hundred fathoms from the bottom of the Atlantic; and he said if they could lift it through a space of seven hundred fathoms there was no doubt whatever that with stronger ropes and power of machinery for lifting they could get the cable of 1865 again, and put it in good working order during the ensuing summer. (Hear, hear). It was only a question of strength of materials for lifting the cable. (Hear, hear). They would have three good ships for cutting grapnels and holding grapnels, so that they could buoy and lift the cable in three parts. Mr. C. E. Rawlins, Jr,, remarked that there were certain buoys laid for marking the places where the cable was lost. Were these buoys in existence? Mr. Canning replied that the buoys were moored quite as a temporary means, but he thought they were floating about. Mr. C. E. Rawlins, Jr., asked if Mr. Canning was perfectly certain he could go to the place where the cable was lost. Captain Anderson said tho real object of the buoys was not so much to mark the place where the ship was at the time the cable was lost as where it was drifting. It was just as easy to find the end of the cable as it was to sail to Sandy Hook or Cape Clear. It was a matter of common nautical astronomy. (Hear, hear). Mr. Varley said in the attempt to grapple the cable on the last occasion, they were near to the end of the cable in order to save it; but supposing any difficulty was experienced in that depth of water, they had only to run into 500 fathoms shallower water, so that it would he unnecessary to grapple two miles deep. He firmly believed that no difficulty would be experienced in getting at it from that depth, but if there should, they could run nearer to Ireland. (Hear, hear). Mr. King - Would there be more risk in underrunning it than bringing it up? Mr. Canning said that if they could only get the bight they would splice on a run to America. He would not think for a moment of stopping the expedition to complete the cable; he would leave another ship besides the Great Eastern, which would be with them to do that work. (Hear, hear). THE WAY THE OLD CABLE IS TO BE RAISED. At a meeting in Manchester on March 15th, the Chairman asked what means would be taken for the recovery of the old cable. 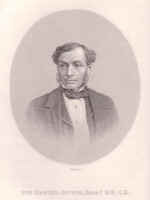 Mr. Canning said that after laying the cable of 1866 they would return to pick up the cable of 1865. Three ships would be used, the Great Eastern and another, which would be a chartered vessel, and a government ship fitted out with machinery for hauling up, the same as the other vessels. In lifting, the ships would be grappling at the same time, at certain intervals apart, from two to three miles. The one to the west would put the greatest strain upon the cable, while the other two ships gently lifted it to the surface. The rope employed would bear a breaking strain of twenty-nine to thirty tons; the swivels would be tested up to twenty-five tons, and the grapnels would be tested up to the same; and therefore, he thought, with this strain, they would have an ample margin of strength. If the western ship, by hauling, should part the cable, there would then be other two ships with the bight on their grapnels, and by so doing, if the western ship should part it, that would materially lessen the strain upon the middle ship and also on the one to the eastward. If the ship to the west did not break it, and they wished to make an end, they could always do that by using the cutting or jamb grapnel which would so damage the cable by the strain put on it that it would break it and make an end. They could also adopt another mode - by lifting the cable up to a certain extent, and then buoying it, going further again, so as to get up the greater length from the ground, and get more slack, for the purpose of lessening the strain upon the cable. He thought that by these modes there was no doubt that they would be successful in recovering the lost cable. Mr. Fairbairn had gone into the calculations and agreed with him in every respect. 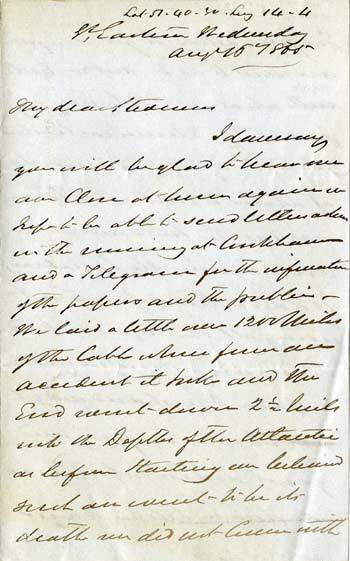 The Chairman said he had some doubts some time ago, but Captain Anderson had so explained the principle he intended to act upon with regard to the recovery of the cable that he had no doubt, if it was done with care, so as not to throw any severe strain upon the cable, instead of having one new cable in operation they would shortly have two cables. Mr. Canning said he thought the fact, that the directors of the Telegraph Construction and Maintenance Company had subscribed as much money as £100,000 toward this new attempt, proved the great confidence which they had in its success. Besides this, eight of these gentlemen had each subscribed £10,000 to the new company, and Mr. Cyrus Field had taken a like amount of stock in the new company.